The Cowbridge Rotary Club Car Boot Sales raise around £3000 each year for Rotary Charities and we would like to thank all who participate. 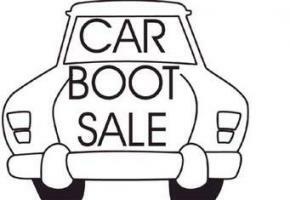 It is held in the car park behind Cowbridge Town Hall. Additional parking is available in Arthur John's car park for buyers. Although held on the 2nd March, our St David's Day celebrations were a great tribute to our patron saint and all things Welsh. 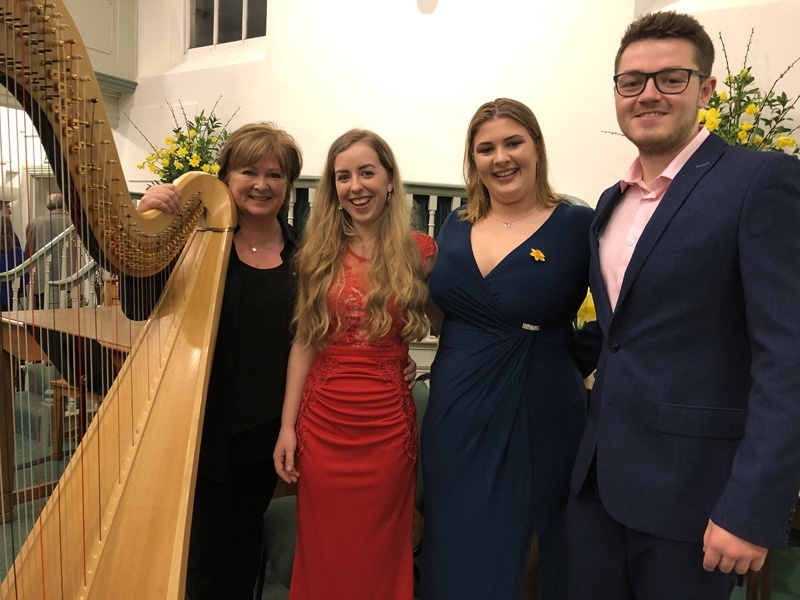 After a delicous meal of cawl and Welshcakes, club members and guests were entertained by three extremely talented musicians from The Royal Welsh College of Music & Drama and Rtn. Caryl Thomas with a selection of beautiful Welsh music and poems. Many thanks to tenor, Osian Wyn Bowen, soprano, Esyllt Thomas and harpist Elin Kelly. Thanks also to Heather Weddell and members of the Cowbridge United Free Church for the use of the Ramoth and to the three Cowbridge Interactors for supporting the event. A total of £1034 was raised to be shared between Samaritans, Y Bont and Homelessness. THE Rotary Youth Leadership Award scheme (RYLA) is one of the youth activities supported by Rotary Clubs and offers young people the opportunity to take part in a challenging week in the Brecon Beacons. The week-long residential course based at the Storey Arms Outdoor Education Centre, concentrates on a range of outdoor activities designed to help students develop their team-working skills, leadership and improve their self-confidence. 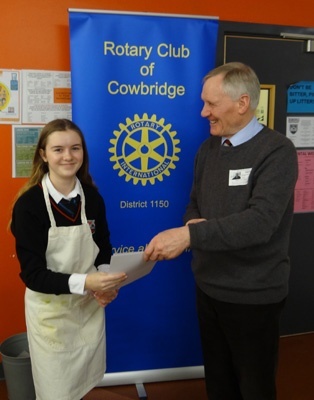 Three separate six-day courses, with 30-40 young people aged between 16-17, are run in the first half of the summer holidays with the costs met by the sponsoring Rotary Club. 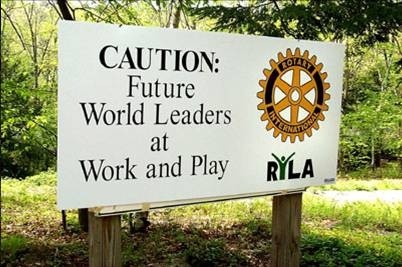 For more information on the course, contact Cowbridge Rotary by clicking on Contact at the top of the page and select "Youth LeadershipAward RYLA"
Cowbridge Rotarians visited many clubs during scatter week but President Michael Long obviously wants to win the prize for the furthest scatter as he visits Byron Bay Rotary on the Australian Gold Coast (10455 miles from Cardiff) where he exchanged banners with their President Colin McJannett. As he is donating the prize, we don't really mind if he wins ! 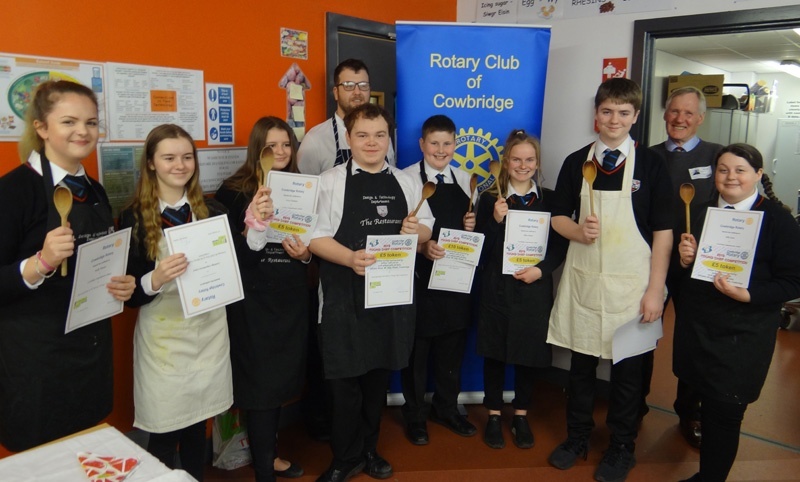 8 aspiring Young Chefs took part in the club heat of the competition. The winner, Lily Marshall, and the runner-up, Cai Hopkins go forward to the Area 7 final. 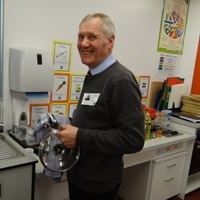 ......and President Elect Peter does the washing up! Club members enjoyed a visit to the local base of the Helicopter Search & Rescue (SAR) service operated by Bristow. It is housed in a purpose built, seven million pound facility on the St Athan airfield. 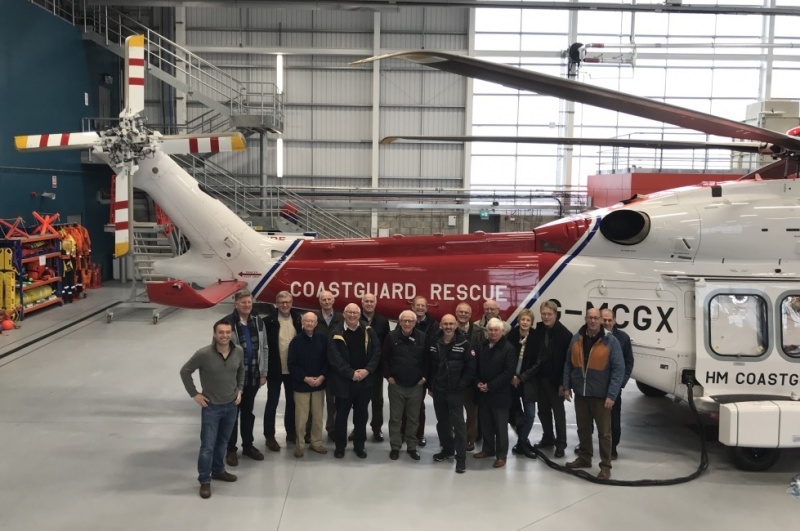 An explanation of administration and organisation of a service that covers much of Wales and parts of South West England was followed by a tour of the hanger and the AgustaWestland AW189 helicopters used for search & rescue. With the support of Rotarians and using part of a generous donation by a benefactor, Year 6 at Y Bont Faen Primary School have started a micro-finance project. Using a non-profit international platform called Kiva they have chosen from over 7,000 listed projects to loan money to 14 deserving cases. The micro-loans of $25 each range from purchasing goats in Kyrgyzstan to children's primary education in Lebanon. This project integrates well into the school curriculum, incorporating elements of geography, maths, IT, etc. The project will soon be extended to Year 5 pupils. To celebrate World Polio Day, the club held a meeting in the Shampan Indian Restaurant. As the theme was piurple Rotarians and their partners had to wear something (visible!) in purple. The four miscreants who failed to do this had to dip their "pinkies" in purple ink to reflect the action taken when children are imunised to show that they have received the vacine. Rotary welcomes new members interested in having fun while 'giving something back' to the community. Fresh ideas and enthusiasm are the life blood of any organisation! It is easy to contact us using the "Click Here" button at the top right of the page. Rotary provides opportunities to connect with people of like ideas, providing unique opportunities to serve the community using one's own professional skills alongside leaders of other businesses and professions. Rotarians help one another, and together help others. Rotary is fun every club holds social activities that offer diversions from today's demanding professional and personal schedules. Conferences, conventions, assemblies, and other events provide entertainment as well as Rotary information, education, and the opportunity for service. Rotary helps personal growth and development by continuing one's growth and education in human relations and by developing and extending leadership skills. Serving in Rotary helps one learn how to motivate, influence and lead leaders. Rotarians are people who believe that whilst it is nice to be important, it is more important to be nice. 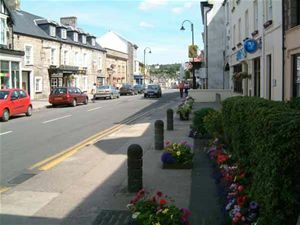 Cowbridge is a township that has developed on the site of a Roman fort built in the 1st century AD. Sir Richard de Clare, Lord of Glamorgan, granted Cowbridge a Charter in 1254 and developed the town. By 1266 Cowbridge had town walls with four gates, although the North Gate was used mainly for cattle. It was an important centre for trade and was the last recipient of a Royal Charter by Queen Victoria in 1886 and was able to appoint its own Councillors and Mayor. This tradition has continued in spite of the local Government reorganisation of 1974. Cowbridge was renowned for its fairs but also became well known for its traffic jams on the main route from Cardiff to West Wales. A bypass to the north of the town solved that problem and the town continued to develop as a business and commercial centre as well as a popular dormitory town for Cardiff. Today Cowbridge is known as the Bond Street of Wales and there are many shops that make the atmosphere of the High Street an enjoyable place to wander and to spend money! A farmers market twice a month also adds to the variety of goods available. 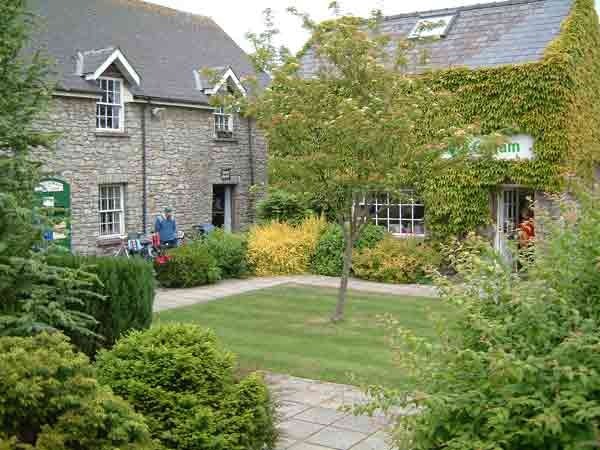 The Rotary Club of Cowbridge was chartered in February 1961, currently has 44 members and meets in the Bear Hotel, a historic coaching inn. We are always pleased to welcome visiting Rotarians or others interested in the work of Rotary to our meetings. Rotary was founded over 100 years ago on the principle of "meeting regularly to enjoy and expand one's circle of business and professional acquaintances." That principle remains true today, and in an increasingly complex world, Rotary continues to provide one of the most basic human needs: the need for friends and fellowship. 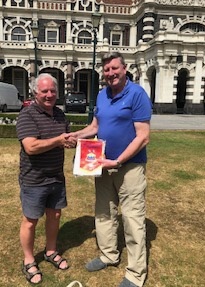 The Assembly will be in Aberdare all 2019-20 club officers should attend.